The plastic guides for installing glass blocks of Durostick provide great stability and ease of application during installation. 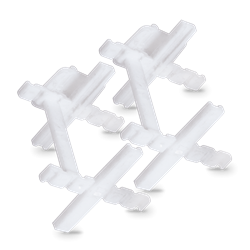 They are necessary for maintaining even joints between the glass blocks during installation. Their key features are their smoothness and their great strength. The basic application of the installation guides of Durostick is the installation of glass blocks of any size or shape. Approximately 25 pcs./m², depending on the size of the glass blocks.